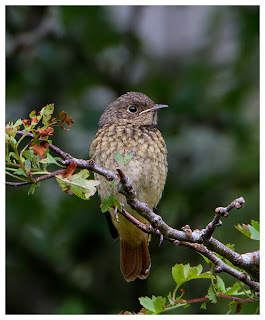 Side-stepping from the usual focus of this blog, those of you who know me will have heard me for years, rabbiting on about getting a pond in my back garden, and at last, I stopped the talking and did the walking (well digging actually) earlier this year. It's not massive - about 6 or 7 feet in diameter, with varying depths as suggested by various articles and websites I consulted whilst planning it all. Filled with a mix of tap and rain water (it poured down just as I was filling it up), I then waited a week or so for the chlorine to evaporate, before stocking with an array of oxygenating plants. Then it was a case of letting nature take over, and boy has it ever! Within a fortnight of the plants going in, newts moved in. I first spotted a bubble breaking on the surface, and then a sighting of a small tail swishing beneath the surface gave their presence away. There were three to start with, but two seem to have remained since then. Not long after that, I saw a pond-skater, though only for a day. Snails have colonised it too, feeding on the plants and matter blown into the water from nearby. 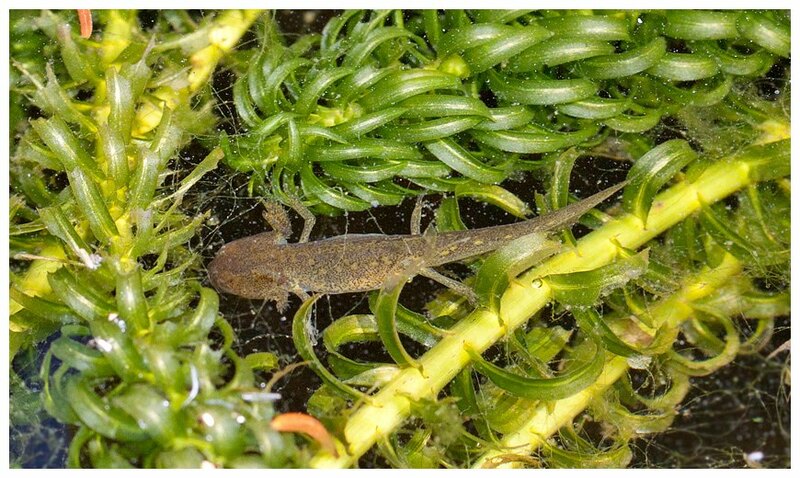 Various micro-organisms can be seen zipping randomly around in small groups, and then most recently, I realised the newts had been up to mischief and now there are dozens of newtlets swimming around in the shadows too. 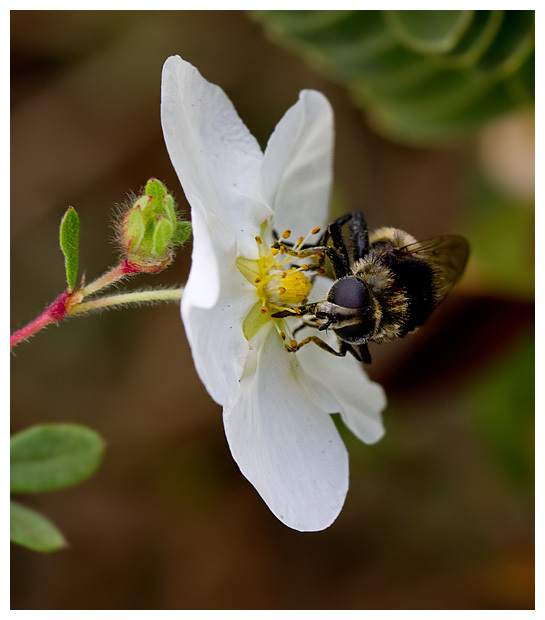 Now, getting photographs with a telephoto lens would be tricky, as spotting the creatures means you need to be crouched right over the water, so while I had considered extension tubes for the 100-400mm, I had also been weighing up the idea of a macro lens. Specifically the 100mm, from Canon. An L lens, F2.8 with IS, which might help with my unsteady hands. I've never been much good with my 105mm Sigma. 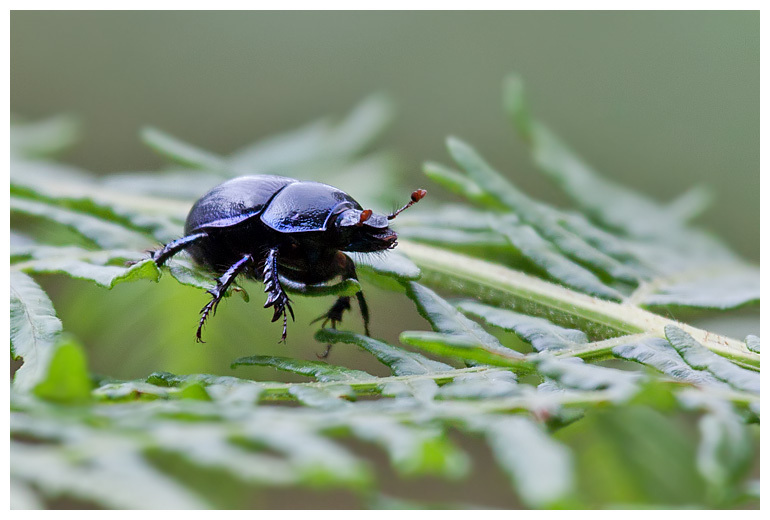 It would also allow me to photo all the insects I encounter whilst searching for birds to photograph! With a free, sunny evening forecast the next day, I ordered from Warehouse Express. They're not the cheapest but offer next day delivery, so the following day I was chomping at the bit to get the lens, and into the garden for bug-hunting, and pond photography. That was until just after midday, when they called to inform me that it had been sent to the wrong depot. This the second time in six orders that they've b*ggered up delivery, and I wasn't happy. Not offering a refund of delivery, I had to ask for it, and then for confirmation of it to be sent before end of business that day, as apparently it had to be signed off by a manager. Nothing, not until just gone midnight, when an anonymous invoice arrived, stating the refund would be credited in 5 days. I expect it'll take 6, as it'll be sent to the wrong place. No goodwill gesture, no follow up email. After spending over £1500 with them since 2010, they'll not be getting another penny from me. The lens however is a gem. While the IS helps with the shakes, the problem now is movement between me and the subject, which means the focal point can miss the intended target, only by millimetres, but with a creature only a centimetre in length, can mean missing it entirely. A new challenge, but I like such things in photography. As soon as I could get out with it, I did, and have been snapping away at insects, spiders and of course pond life. 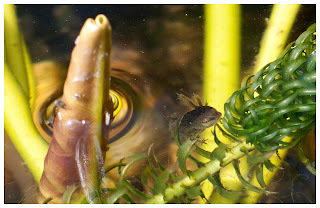 The newtlets are a target, though focusing through water is almost impossible. When they come to the surface, it's more possible. That said, when they're out of the water, it's easier still, as I found out yesterday with one on a reserve in Worcs. At long last the rain that had plagued England and Wales for so long moved elsewhere, and I had a chance of a sunny day out. I chose to head to Frampton Marshes, as it's not a million miles from where I got the recent barn owl shots from, but also offered possible sightings of marsh harriers, and other birds of prey from "Raptor Corner", pin-pointed on a map, by Ian. The drive up was pleasant apart from the fog in the valleys, though the Sat-Nav took me a different route to that expected, so kept me on my toes. 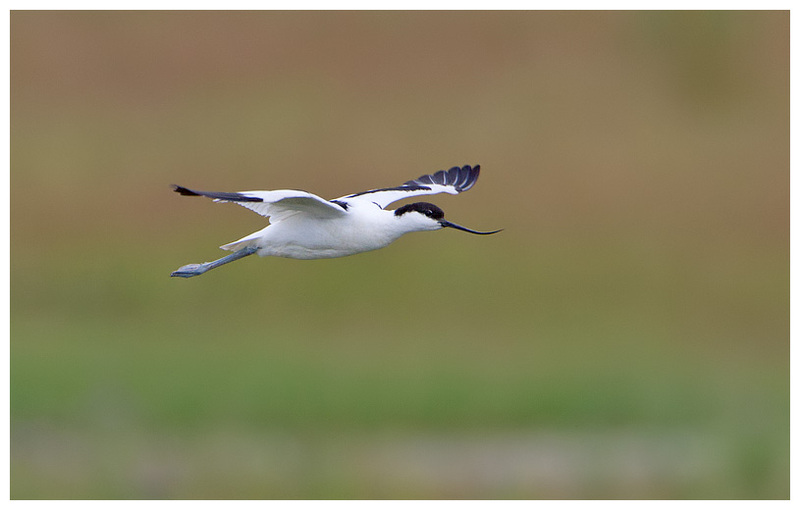 Parking up past the main RSPB centre, the first sounds that greeted me were from avocets, taking flight to chase anything that was available to be chased. It was calm, sunny and warm, and there weren't many folks around. I made my way along the raised bank to the corner Ian had suggested, seeing a kestrel and a marsh harrier along the way. Both too distant for pics, and it was from these sightings that I almost wished it wasn't so warm. Heat haze. It wasn't even 9am, and it was so bad it was affecting shots close to the ground from less than 30 yards. There was plenty to see, with common sandpipers and both adult and juvenile avocets on the pools, various geese around and terns making the commute from the feeding grounds of the marshes back to the nesting areas near the hides. Plus the usual array of noisy gulls. 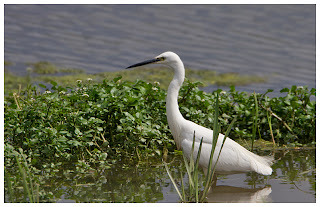 It was from watching these that my attention switched to something else, hunting the marshes. A barn owl. I increased my walking pace along the bank, though I could see someone closer to it, which gave me hope that it'd not vanish as soon as I approached. Alas no, the owl was in fact spooked by the walker, who as I finally reached where the owl had been hunting, told me he'd managed to get within 50 yards of one earlier in the week, by creeping along. I was tempted to ask why he'd not employed the same tactic today, but I think with the haze, I'd have needed to be within 20 yards to have got a decent image. While it was lovely viewing the areas across the marshes, and very warm, the horrid flies trying to bite and constantly flying in my eyes and ears, encouraged me to head onwards, and after a brief view of the map of the area, I headed to the narrowest roads I could find. "Little bit of bread and no cheese!" 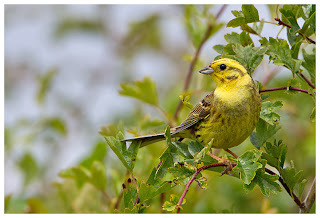 alerted me to the presence of yellowhammers, and parking up near a hedge where the birds were calling from soon yielded some results. 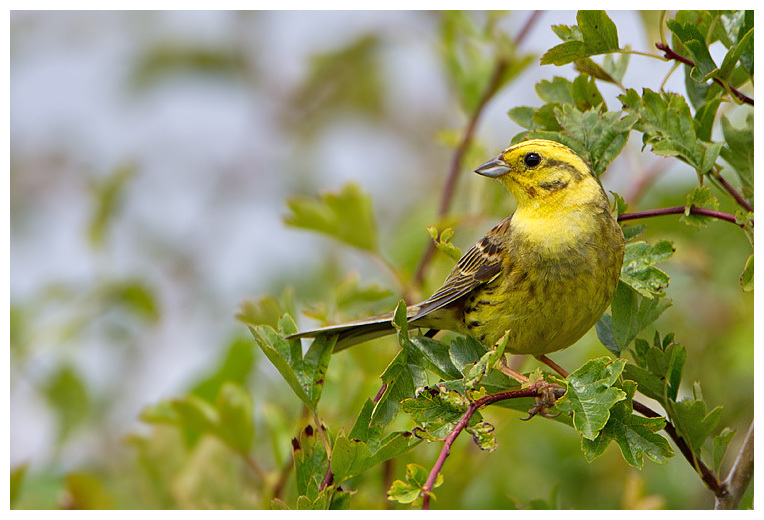 These birds glow on dull days, so it was a challenge not to blow the highlights on such a sunny one. A bit further down the road, another song caught my attention and it was one I'd not heard since Uist, back in 2010. 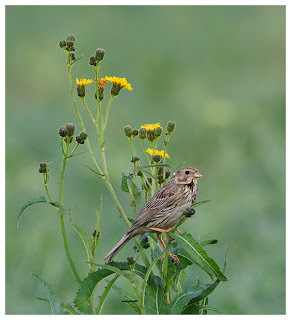 A corn bunting, who was initially sat singing on a telephone wire. 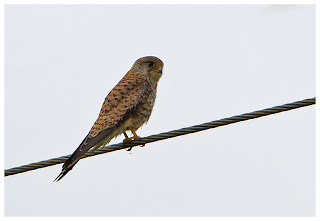 Thankfully it relocated to the crops growing in the fields beside my car. Lovely birds, which are sadly a rare sight these days. Having exhausted my bottle of pop, I was gagging for a drink and there weren't any shops nearby, so I headed to the barn owl area, calling in at a garage along the way. Ice cold Ribena never tasted so good! Ian and his parents turned up later, which made the wait for something to show up more entertaining. Plenty of great crested grebes on the river, small flocks of common terns danced by, and I managed to get a few shots of a little egret, trying its luck on the shore. 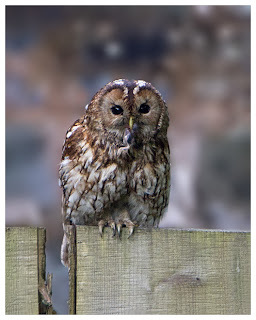 That was about the only luck we witnessed on the evening, as the owls, while they occasionally ventured out, were always distant, and seemed to be more interested in checking out the various buildings in the area. No signs of grey partridges either, though I did see a vocal male red-legged variety, cackling from a barn roof. And the hares as ever stayed away, limiting me to very hopeful long shots. 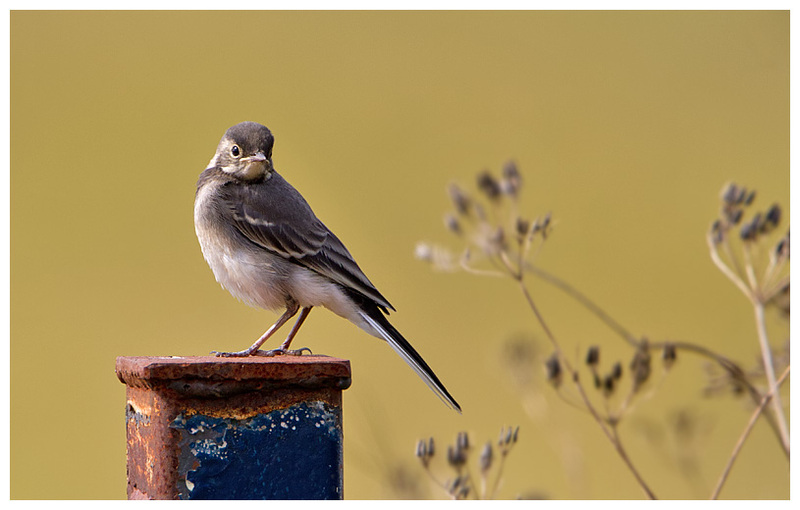 Though a juvenile pied wagtail took pity on me, and posed on a post near my car. 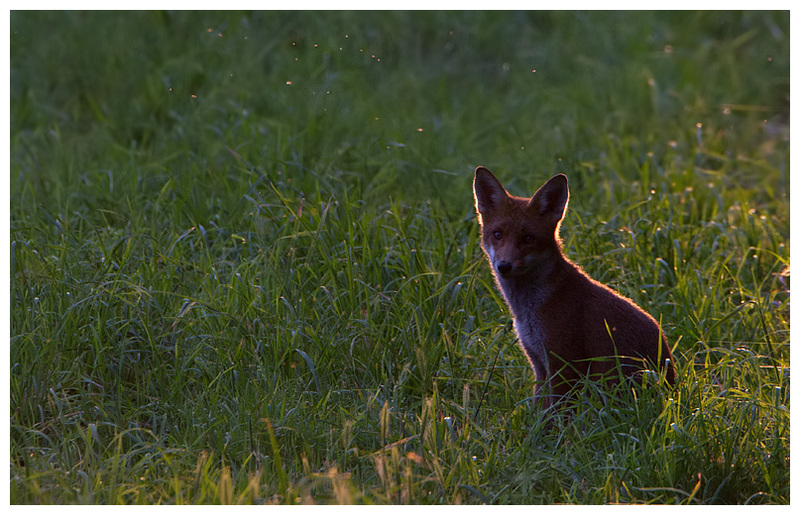 And just as the sun was starting to set, we spied a pair of young foxes, which didn't seem to know what to do, when a male pheasant wandered by. 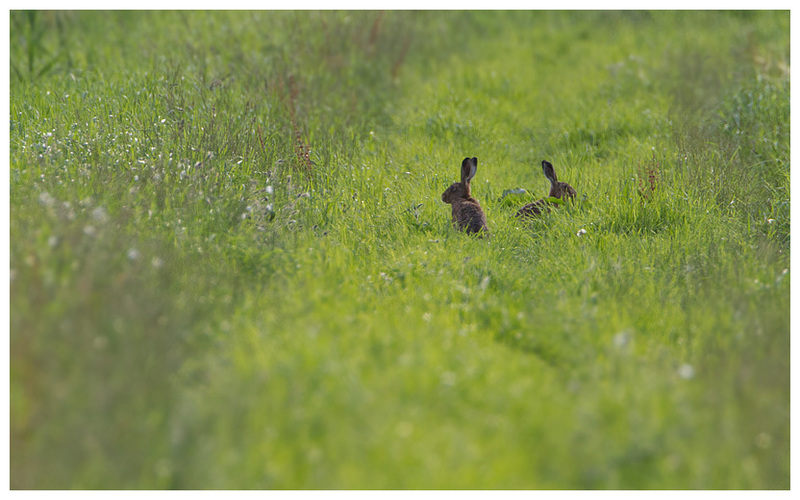 They were more interested in us, as we poked our big lenses out of the car window, to capture them, sat in the grass. 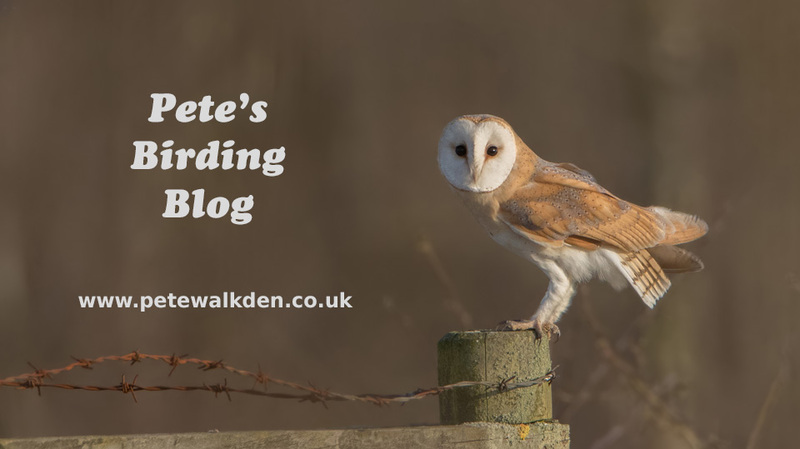 As before, on the way home we saw another barn owl hunting near a main road, begging the question whether we should move our hunting grounds there next time too? 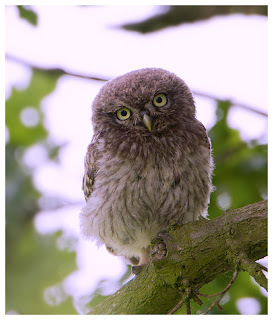 Followers of this blog will I'm sure be aware of how often I watch the local little owls, and at this time of year it's more entertaining than usual, as the chicks are out. 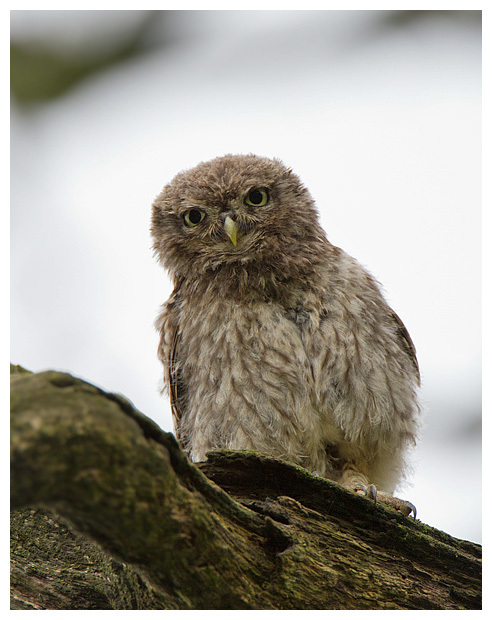 For a few days before this last weekend, I had been deliberately taking a detour to pass by their tree, to see if anything was going on, listening out for the tell-tale screech, of a chick pestering to be fed. 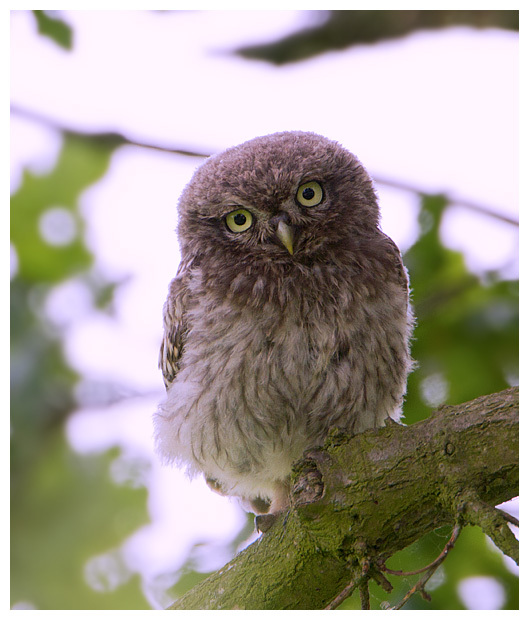 During the week, I spotted an owlet hiding at the bottom of the tree, but only at dusk, so it wasn't really good for photos, but it gave me something to do at the weekend, and as it happened, I managed to get down there at Friday lunchtime for an early viewing. With the almost constant rain we have suffered lately, the verges beside the lane are boggy to say the least, and I was very glad of having the Yeti with its 4-wheel drive, to get me out of the mud, where I am sure my old Fabia would have got stuck. 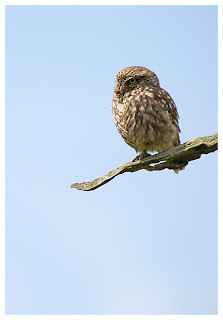 Normally upon arrival, it's a challenge to locate the owls, but this time, one was sat out in the open on arrival. As is often the case with youngsters, they're not scared of humans; more curious, and after bobbing its head around a few times, it hopped on to a branch nearer to me, for a better look at me! I had to roll the camera over to fit the little furball into the frame. Ignoring the shutter, it then proceeded to preen and clean for several minutes. Only the return of one of the adult birds sent it back to hiding, and it vanished behind the trunk for a while. 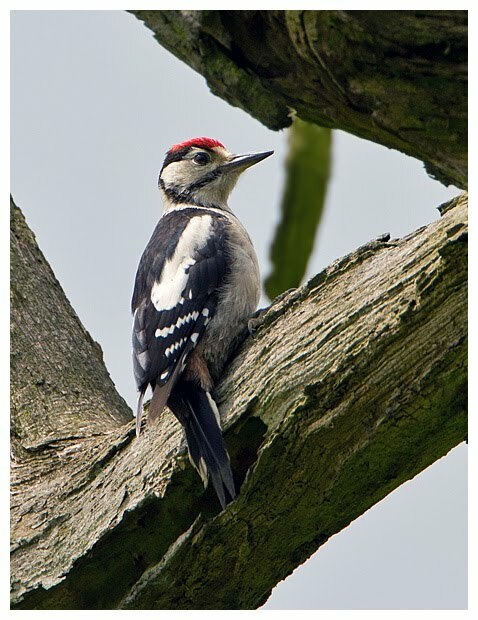 The afternoon was fantastic for viewing the parents as they were flying between the trees frequently, though they seemed to arrive back when you least expected it, and often when I wasn't looking, and I'd turn to see one sat nearby, glaring down at me. Which is sort of what happened shortly after, when an adult returned with an earthworm, and passed it to a chick which appeared from nowhere, on the side of the main trunk. 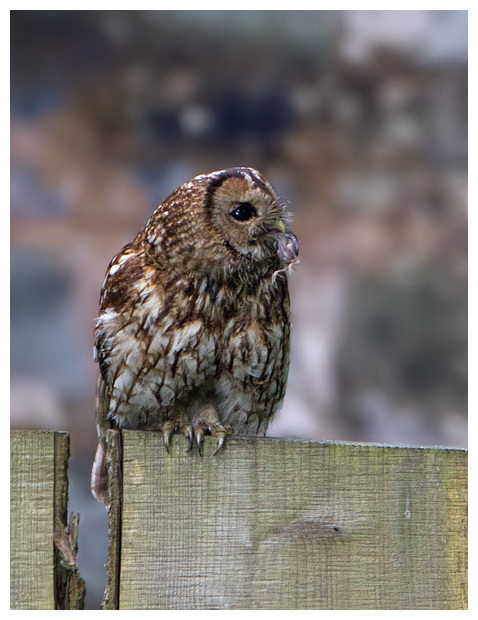 I saw it, but there was no way I could get the lens lined up in time, and all I saw was a rather pleased owlet licking its beak after scoffing down the worm. That would have been a superb shot, and as usual, I saw it, but failed to capture it. Still, the owlet looked adorable sat there, and I took a few more shots. Several more feeding moments occurred, but all below the hedge, out of sight. 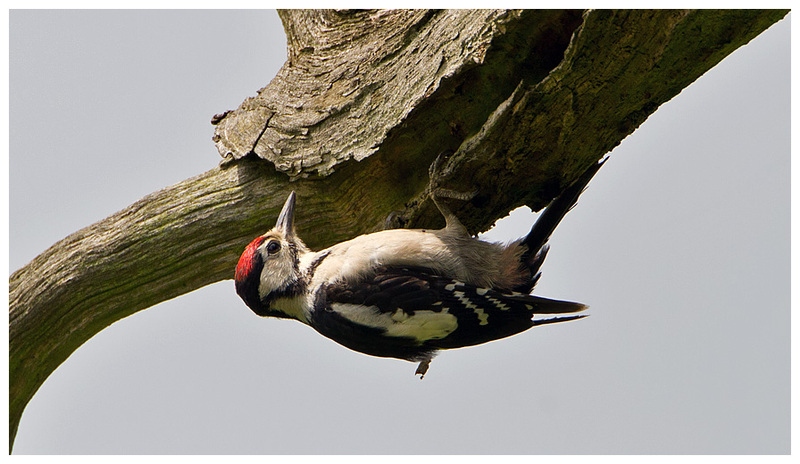 I'd just hear the screeching intensify, then silence, with the adult flying up to the branches to preen for a while. Mucky business getting worms on a wet day. I managed a few more photos of one of the chicks (pretty sure there are only two of them) as again it perched very close, and with all the action, I thought it would be nice to share it with some friends. For once I thought the owls would be a dead cert for showing, and inviting friends over, from a few miles away, wouldn't be a waste of their time. We all agreed to aim for Sunday, as the forecast was for something called "sunshine". 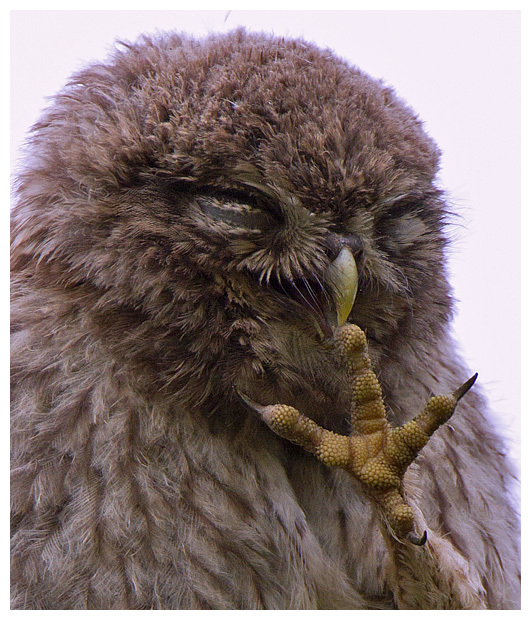 So Saturday morning, I was keen to check on the owl family again, and expected to be treated to the same show as before. Hmm, I should have known better, as wildlife can never be guaranteed to perform, and for the hour I sat there, I saw only fleeting glimpses of the owls, adults or otherwise. I started to wonder if the plan for Sunday was a wise move after all. I did manage to get a few shots of a juvenile great spotted woodpecker, as it pecked and probed around the dead parts of the old oak tree. Seemed to be well skilled in hanging on already. Failing to see the bad omens on the owls, I then took the M40 down to RSPB Otmoor, on yet another attempt to see a turtle dove. I've been loads of times and the best I've ever managed is to hear one. The day continued where I'd left off from the owls. 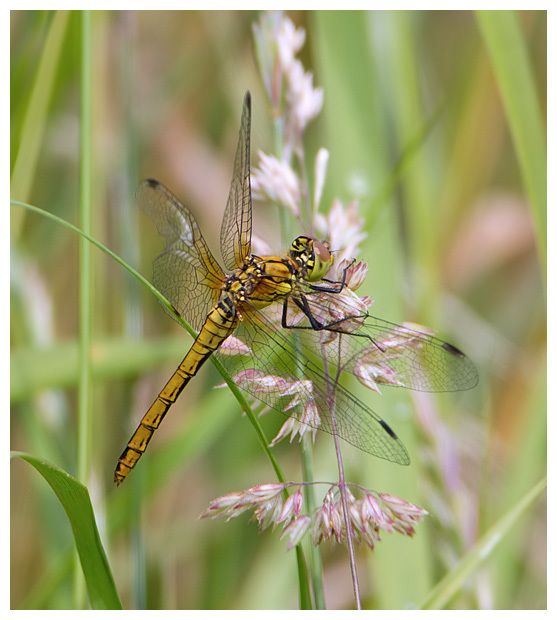 I saw masses of dragonflies as I wandered down the path. Using the 500mm isn't easy for such things, as you have to stand about 5 metres from the insect to get a focus (I need some extension tubes). So I got out the 100-400mm, turned around and it was like someone had hidden all the insects. Nothing. Not even when I poked the tripod leg into the shrubs. Put the camera away, and they appeared again. I took a shot with the 500mm anyway. I think it's a female common darter, but I'm no expert. With all the dragonflies, there must be hobbies, right? Yes, but either perched half a mile away in the middle of the RSPB's conservation area, or even further away, high over my head. The Otmoor Blog had reported a few waders from the hide, so I walked down towards it, seeing and missing blackcaps, whitethroats and even a grasshopper warbler. They'd either fly off when I lined the camera up, or there would be something in the way of the shot. 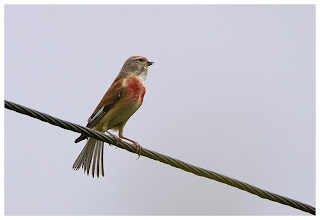 The only thing I did see for a second or two was a male linnet, singing from an overhead line. Out of the hide window I could see.... a swan. Oh, and a grey heron on the far side of the field. Awesome. It was late, I was fed up and I left, once again dipping on turtle doves. No partridges or pear trees either, before anyone comments. There was a lone kestrel on the road out of Beckley, but it was raining by then, so nothing special. Sunday, and a text from Ian meant I had to get up. I wasn't as fresh as I should have been, but Scotch whisky is rather nice, from time to time. As was the ale I'd had before it. Shortly after, Kate (WildlifeKate to viewers of Springwatch, Gardener's World, Midlands Today) confirmed she was also on her way, and we were soon parked up (all in the Yeti) beside the tree. The forecasters were right, it was actually sunny, which made the light quite tricky for photos. 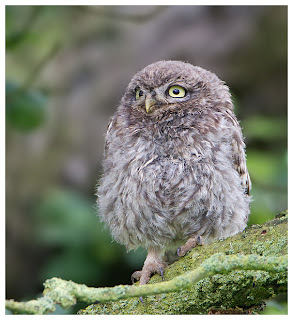 No owls initially, but eventually one of the chicks put in an appearance, hopping round to the front of the trunk, and allowing both Ian and Kate to get some shots. Being the kind soul I am, I was sat on the other side of the car, so could only get the occasional shot, though I have a few already! Just as I was explaining the habits of the owls and that the adults often preferred to sit in other trees, Kate followed my pointing finger and spotted one of them sat in another tree! A great spot, and with her smaller 100-400mm lens, she was able to lean out the window and get some pics of it. 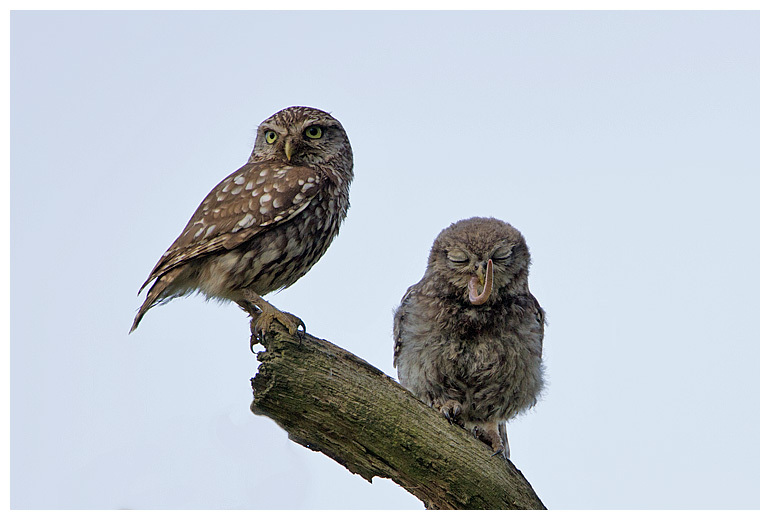 Sadly, unlike the Friday, the birds didn't put on that much of a show, with the owlet returning to the same perch each time. The light improved and Kate borrowed my lens for some closer shots. She wasn't too impressed with the weight of it though! With only a couple of hours to spare, Kate had to reluctantly leave, and I spun the car round so I could view, with Ian still lurking in the back. 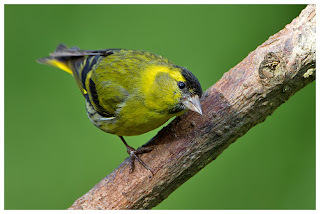 One of the adults flew in, and sat on a dead branch which made for a superb perch. 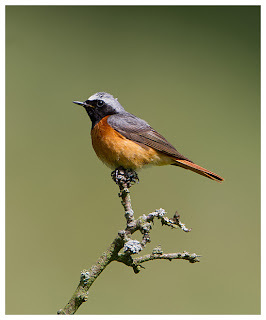 We again managed to miss a fab shot, when it flew off the side of the tree, hovered for a split second whilst trying to grab a flying insect, before returning once more. Was good to watch mind you. Both of the chicks were now out in the tree, and we tried to get shots of them, setting the cameras up for darker images, with them hiding amongst the leaves. 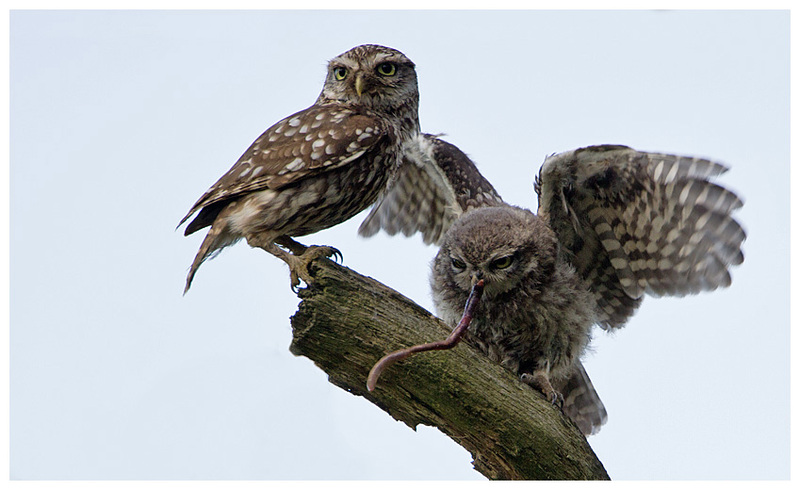 As usual, the adult timed it to perfection to return with a huge worm, and one owlet made the dash over to collect it. Both Ian and I blasted a dozen or so shots off, only then to realise we'd under-exposed the shots. Thankfully, not by too much, and the resulting images were actually pretty decent. The adult actually puts the worm into the beak of the chick, then stands back on guard, whilst the youngster battles to eat the worm and not fall off its perch. Amusing to watch and made for a great set of shots. 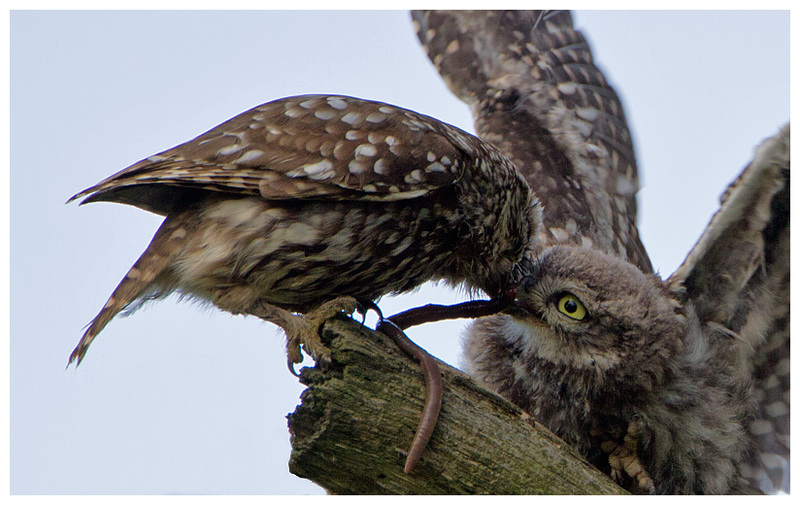 The adult caught another worm later, and with the other chick screeching to be fed, ate the worm itself! Rather mean of it, and perhaps why these owls look so grumpy as they get older? Summer weather soon returned, clouding over and the light became horrid. Ian and I opted to relocate to a nearby pub for a pint and a ham roll. He'd taken over 500 shots, most of them being keepers. Though he'll probably only process about 3 of them, knowing what he's like. A great morning, not just with the owls but also catching up with good friends. Had to get the car cleaned after though - was caked with mud! 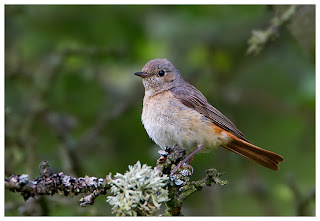 While mooching round the woodlands of Cannock Chase is always fun, I had been watching the flood of fine shots still coming out of Gilfach Farm, of redstarts posing, even on people's hands! Problem was, had I left it too late to go? I knew if I didn't try I'd always be asking myself, so at 5am on Saturday morning, the alarm sounded, and by 7:30am, I was driving across the border into Wales. The forecast wasn't great - sunshine and showers, and rather windy. But at least it was reasonably bright. 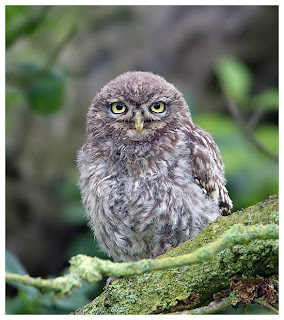 Which was handy when, as is tradition, I stopped off on the way to see if a tawny owl I had been told about was out. I've never seen it before, so didn't expect anything, but was pleasantly surprised to spot a brown shape sat on the fence. Praying it wouldn't fly off, I carefully lined up the camera and took a few shots. There was a lot of chatter from nearby birds, but that isn't unusual, as they often go a bit mental when these secretive owls are visible. Then I spotted something hanging out of the owl's beak. I assumed it was a rodent, but later inspection revealed the prey to have been a chick, which goes a long way to explaining the reaction of the nearby birds! I wonder if it had found a nest, and was perhaps picking off the young one-by-one? 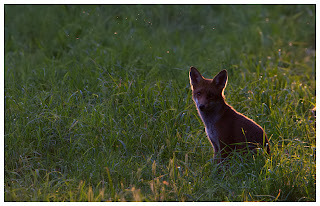 I didn't have long to watch, as it turned tail and disappeared into the shadows behind. I waited for a while, but there was no sign of it returning. A good omen for the day, perhaps? Over at Gilfach, I started to think perhaps not, as the car park was empty and after 15 mins in the courtyard, I'd not seen any sign of redstarts. 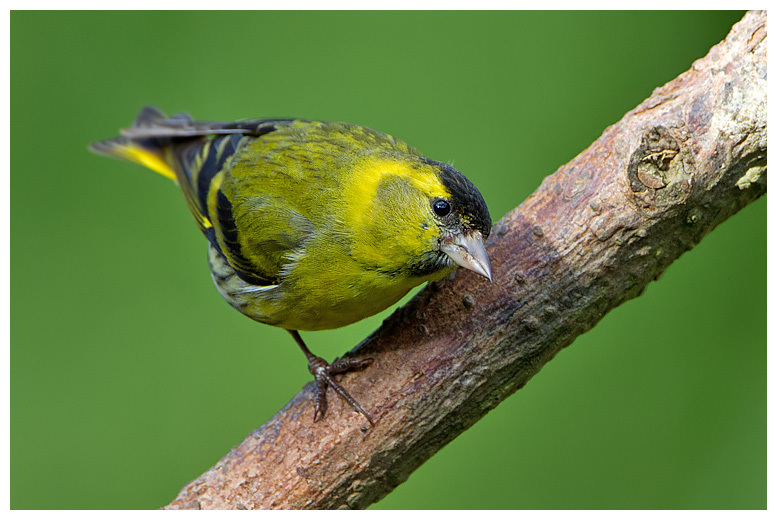 I took the chance to photograph some of the brightly coloured siskins visiting the feeders though, which made up for a lack of them locally over the winter. Then Pip wandered out of his cottage and broke the news I had started to expect. 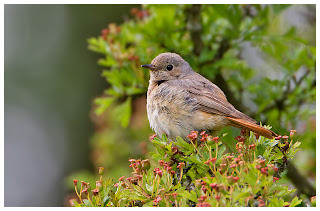 The redstarts had fledged and gone. He'd not seen them for a few days now at the courtyard. Bugger. Well, I thought of something else, but I can't put that on here! However, I'm not one to be put off by the fact that a subject has moved on. No... If the bird has left, then I'll go and find it again. Which I did. Just as I was driving out of the farm, I clocked a flicker of a red tail in a tree. 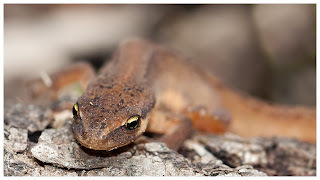 A male. I quickly parked up and wandered back to find the male, female and a few fledged chicks, all in close proximity to one another. Ok, they wouldn't be posing on a carefully selected perch, or feeding from my hand, but at least I had a chance of some shots after coming all this way. 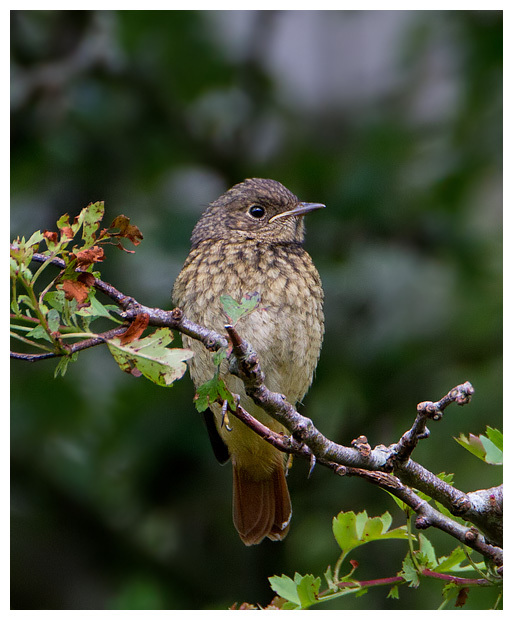 The female seemed to favour the area I had chosen to stand by, coming pretty close at times, perching in the trees or on posts, dropping down to catch grubs, before zipping off to a waiting chick nearby, to hand over the meal. Conditions weren't easy though, with the strong breeze moving both me and the subject around at times, and with passing clouds and showers, it meant continuously having to adjust the ISO, shutter speed and aperture settings. The chicks generally stayed hidden in the middle of the trees, though I did manage a glimpse of one, long enough for a shot or two. Both the male and female called to each other constantly, and it increased in frequency and volume when a sparrowhawk sped through. Thankfully it carried on by, and didn't take any of the family. 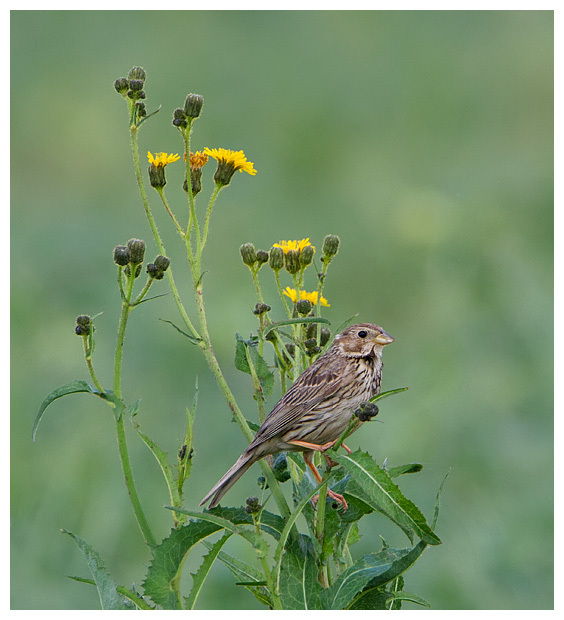 I tried to position myself closer to where the male was singing from, and he moved to where I had just left! So I moved back and just waited. Eventually it paid off, with him landing on the edge of a tree, momentarily. Then the skies went very dark and I legged it back to the car for shelter - a wise move as it chucked it down for about half an hour! Nothing like summer time... I moved elsewhere - driving around the back of the Elan Valley again. I hoped to catch up with the whinchat I'd seen before and within 5 minutes of parking up, I got a glimpse. 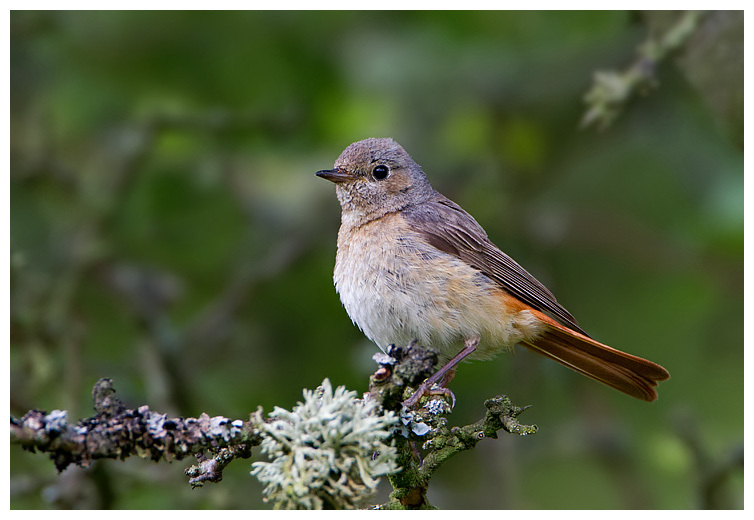 Saw both the male and female, though she stayed very much distant. By now it was past lunch and I wanted to head back towards home. I called in at Clee Hill on the way, to see if any wheatears were around. 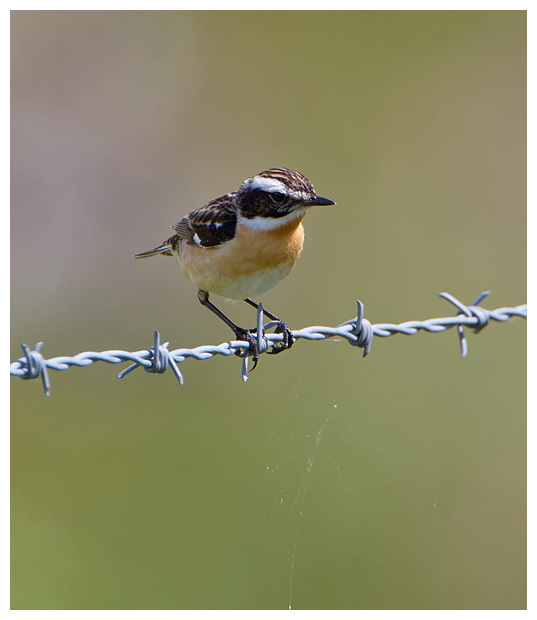 Like the whinchats they were mostly far off, in small family groups following the parents around picking up insects as they went. 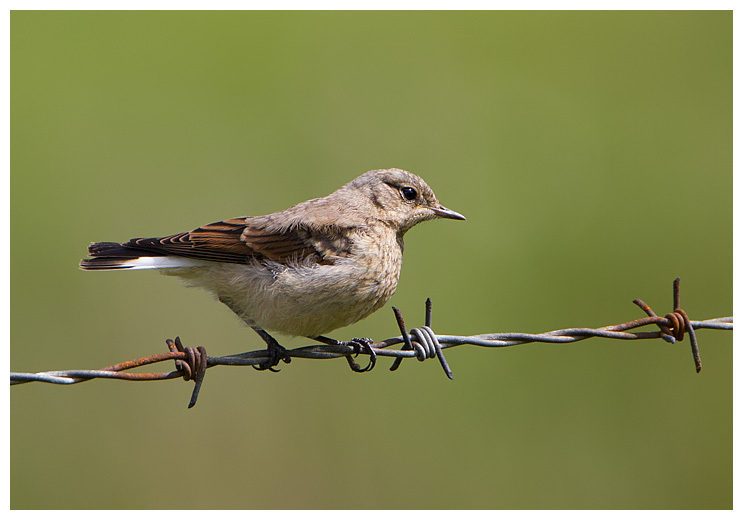 But one juvenile popped up near the car, and perched on a fence for a second or two. When it started raining there too, I decided to call it a day. Sunday started with clear blue skies, but by the time I had got ready, it had clouded over and wasn't that warm. 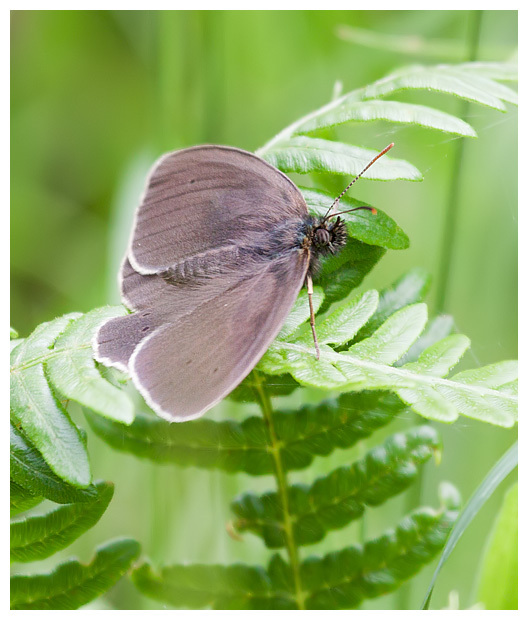 I wanted to revisit the Wyre Forest to try for adders, but I'd not realised how different it would all look now. Ferns covered most of the ground, so finding any would be tricky and I wasn't up to the task. Still, the 100-400mm allows for close-ish focusing, so I made do with that, when I spotted a butterfly perched up - a ringlet apparently. 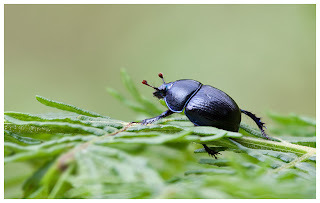 And later a blue / black beetle which seems to be a dor beetle. I actually popped it on to the fern for a better perch, which might be frowned upon, who knows? !